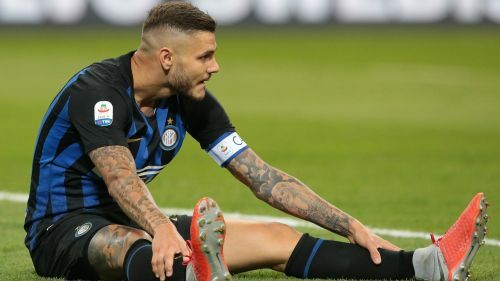 Mauro Icardi has been cleared to train by Inter's medical staff but the former captain said "I'll tell you when I feel ready to play", according to head coach Luciano Spalletti. Icardi has not played for Inter since he was stripped of the captaincy and replaced by team-mate Samir Handanovic amid uncertainty over his future. The 26-year-old star – who has asked for more respect from the Serie A club – complained of knee pain after missing the Europa League win at Rapid Vienna on February 13, though Inter could not identify any specific problem. Icardi was once again absent on Thursday as Inter played out a goalless draw away to Eintracht Frankfurt in the first leg of their Europa League quarter-final. | All the photos from a hard-fought draw away at @eintracht_eng. We go again next week at San Siro! Asked about Icardi post-match, Spalletti told reporters: "The truth is that we asked Mauro if he felt like resuming training. "The doctor said that in his view the necessary period for treatment had terminated. He replied: 'No, I still feel pain. I'll tell you when I feel ready to play'. "I acknowledged what he said and went back home. The director [Beppe Marotta] will tell you the rest." Icardi – contracted until 2021 – has scored 15 goals in 28 appearances in all competitions this season but has not played since the 1-0 Serie A win over Parma on February 9. He has been linked with the likes of Real Madrid, Juventus, Barcelona, Napoli, Manchester United.